We receive many requests from groups and organizations to donate clay to Empty Bowls type projects, and we’ll continue to do that because we believe in those projects. But we also wanted to take a little more active participation role, too. We came up with the idea of an Empty Bowls Bowl-A-Thon to address that desire. On Saturday, September 9th, we will open up our studio and provide clay and equipment (wheels, a slab roller, an extruder, slump/hump molds, and some basic tools) to make bowls. 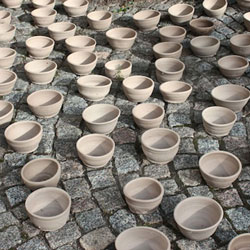 small unfired bowls – made & photographed by Heyjoo Yang for a 2012 exhibition in Sweden. 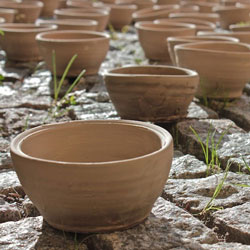 Image selected to represent the empty bowls we hope potters will create during the event. Bring your pottery skills and your creativity on Saturday, Sept 9th and we’ll have an Empty Bowls Bowl-A-Thon! Potters of all skill levels are encouraged to participate. We’ll have snacks so you don’t get hungry as you’re helping to make bowls for hunger awareness and prevention. If your organization or group hosts an Empty Bowls event that uses the bowls for hunger awareness and prevention, we will accept applications for donations. You can request clay, bisque fired bowls or glazed and finished bowls. Just fill out the form below. This is strictly a volunteer-based effort. If you’d like your bowl(s) earmarked for a specific Empty Bowls style event, let us know. Otherwise, we’ll do our best to pass on your bowl(s) to worthy events that meet our criteria. You may choose to sign the bottom of the bowl. Whether you sign your name or not, we’ll use a Flint Hills Clay Works stamp to mark the bottom of all donation bowls. Will you need people to trim them later also? Yes we will definitely need people to trim. 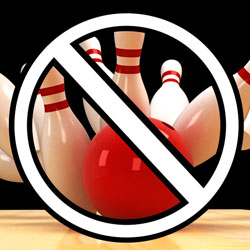 If you can’t make it to our Bowl-a-Thon but still want to help, you can add your name to the list of people who want to trim during the next week (you can come trim any time Bracker’s is open – just call first to make sure we still have pots that need trimming).